This week we’ll switch our focus from the master suite bathroom to the kitchen. 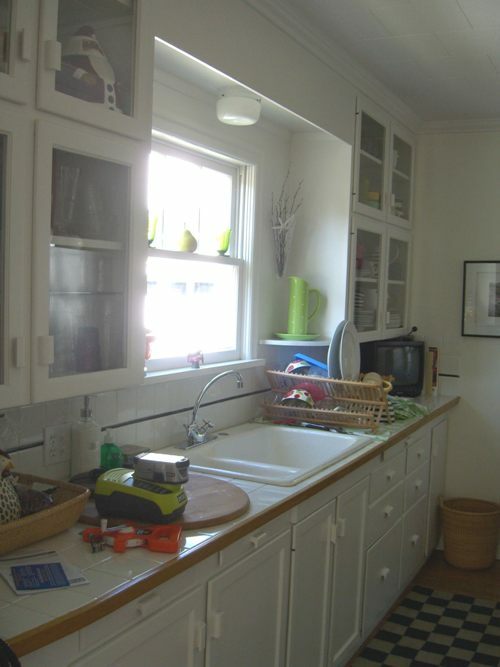 This kitchen went under an enormous transformation through a 75 square foot addition and the relocation of all three legs of the work triangle; sink, refrigerator and range. 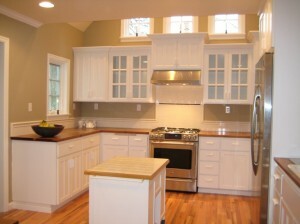 Previously, the work triangle used three of the four walls of thekitchen and consumed basically the entire floor area. The problem with this layout was that to get from the back door to the rest of the house, visitors had to go through the kitchen and directly through the work triangle. To accommodate the need for traffic flow through the space the upper corner of the kitchen was made into a pantry/ baking center and the remaining space was used to create the work triangle. Now traffic from the back door flows around the work triangle, and the cook can cook without worrying about colliding with passers-by. To increase storage and ease of access to storage, several unique products were used. 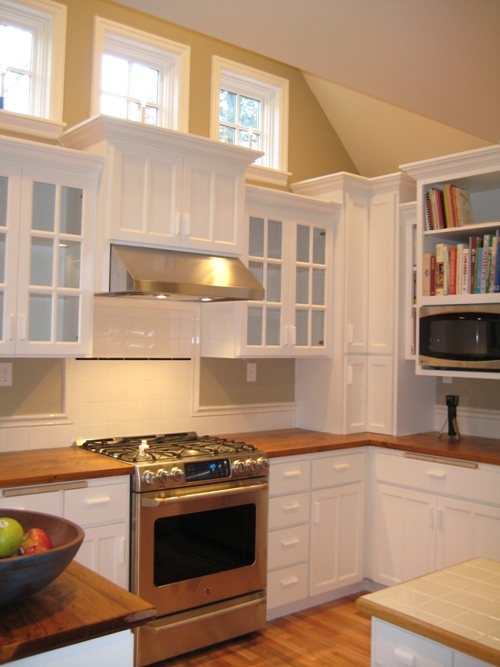 In each corner cabinet a blind corner optimizer was installed. These cabinet accessories pull-out, then pivot and allow you to pull-out the “blind” part of the cabinet. This allows full use of the blind cabinet without crawling on hands and knees to get to the back of the cabinet. Also, all of the lower cabinet have roll out shelves to eliminate having to reach to the dark back depths of any cabinet. 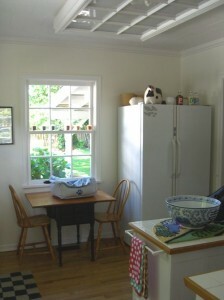 Up top, the cabinet above the fridge is equipped with flipper doors that fold back into the cabinet and a cable jack so that the TV can be seen from the dining room, when desired. 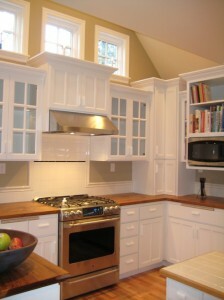 The painted cabinets, and simple door and pull styles match the Cape Cod charm of the rest of the home. To add visual interest some of the cabinets include glass doors with grids that match the windows. 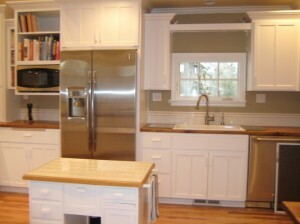 Notice the beautiful pine countertops that were installed in the kitchen. 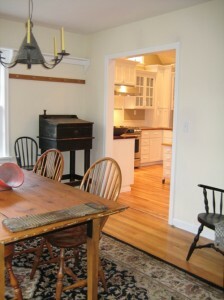 This unique feature really adds a New England appeal to the space. The look of the cabinets was kept simple, for example quarter panel doors with a center mullion and a plain 4×4 white tile backsplash. 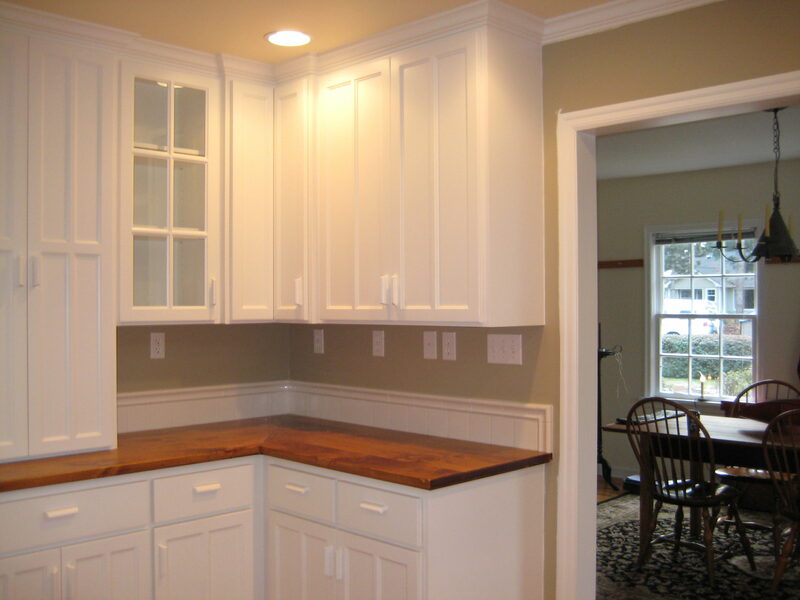 However, small flourishes such as crown molding throughout the room and staggered cabinet heights really highlight the design as a whole.